EPScan is a plugin for PEiD, a files identifier specifically designed for PEs (Portable Executables); it's able to detects most common packers, cryptors and compilers. EPScan add the ability to scan a serie of executable files and detect common patterns in the firsts 128 bytes of code at program entry point. This way, the process to create a new signature for a specific type of EXEs is greatly simplified. Running the plugin will trigger the scanning of all EXE files in the same folder of the currently selected one. In an instant a dialog box will show the extracted common bytes. As the format used is the same of PEiD's USERDB.TXT external signature file, it take just some cut & paste to quickly add the brand new signature. 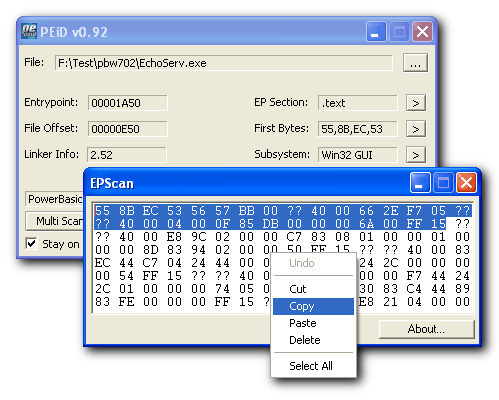 Just unpack the EPScan.dll in the PEiD's plugins folder.